Sealed Lead Acid batteries come in a variety of technologies. Each technology has its attributes, advantages and disadvantages in any given application - however, they all remain 'Lead Acid' batteries even the lead carbon battery except of course the Silicon battery. Where a regular flooded battery has the electrolyte in a 'wet' fluid state, also referred to as 'free electrolyte', the essence of a sealed battery is to immobilise the electrolyte. However, it is necessary that the gasses generated during charging are recombined in a so called 'oxygen cycle' returning to the active plates as H2O once again. Should the gasses escape, a gradual drying out would occur. To assist in the recombination of the water's constituents, oxygen and hydrogen, the sealed case is held in a positive pressure of 2 or 3lbs above atmospheric pressure. In the case of rapid generation of oxygen gas exceeding the oxygen recombination absorbing capacity, the pressure relief valve will open to release the excessive gasses. SLA (Sealed Lead Acid) batteries otherwise known as VRLA (Valve Regulated Lead Acid) were originally known as "Dry Batteries". They were introduced in the 1950's and at that time untilised a Gel electrolyte. The otherwise free acid was immobilised with a fine silica powder and formed a gel substance. In the 1970's technology moved to AGM (Absorbed Glass Mat) where the separators between the plates were made of a felt of micro-fine glass fibers absorbing and immobilising the acid. AGM became the preferred VRLA technology for use in stand-by, deep cycle and start applications. But as time has gone by and the need for improved battery time life and cyclic life, the chemistry has evolved to suit. To illiminate the biggest lead acid problems, corrosion and the formation of lead sulphate, the answer was to remove as much of the sulphuric acid as possible within the electrolyte. Hence the Silicon battery PbSi is born. (Also known as LeadCrystal batteries) To overcome the fundamental shortcomings of the lead acid battery, be it traditional AGM or Gel, a new patened chemistry (by SoNeil of Canada) based on five propiertry technologies: Transluent Silica electrolyte and its preparation method, the irrigation fluid device and its battery plus liquid method, battery terminals connected protective devices, battery boxes and condensate liquid. Conventional sulphuric acid solution is replaced by SiO2 cleaning composite in these Advance Technology batteries. 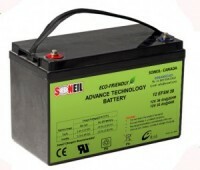 ATB has many advantages over the conventional Lead Acid or gel batteries like long useful life. extreme operating temperatures, low gassing, environmental safety and high rate dicharge. The battery can be discharged to 100% depth of discharge (zero) and recharged without loss of integrity. It can be stored for up to one year without recharge. Enhanced cyclic life -1500 cycles at 80% DoD. Up to 2500 cycles at 50% DoD. Operating temperatures from -40c to +65c. Applications include: Electric Vehicles, Golf carts, material handling and cleaning machines, RV and marine, medical, telecommunications and Renewable Energy Off Grid applications. The Silicon battery technology out performs Lithium at far less cost and power management issues. Due to long life and reduced need to replace battery banks, the 'cost ownership' is reduced dramatically.